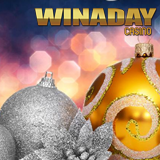 For those of us with some extra play time over the holidays, WinADay Casino has just the thing -- a $15 free chip! Beginning Saturday, everyone that's made at least one deposit this year gets a $15 free chip. If you're a VIP player you'll get up to $75! Use your free chip to play any of the casino’s slots or Keno games. There’s also a selection of deposit bonuses with various wagering requirements available until the end of the month. Bigger free chips for VIPs and a choice of deposit bonuses also available December 23-28, 2017. Tropical Treat is 50 payline game with starfish, sand castles and surfers on its reels. Three scatter symbols trigger ten free spins with 5X multiplier. Not long ago, a working mom daydreaming about the beach hit the jackpot playing Tropical Treat and won over $182,000. All coupon codes are valid December 23-28, 2017 only. Max. cash-out: 7X. They’re valid for all slots and Keno. Bonus code: SANTASTIC. Wagering requirement: 23X. Valid for all slots and Keno. Bonus code: SLOTASTIC. Wagering requirement: 17X. May be claimed once per day. Bonus code: GAMETASTIC. Wagering requirement: 13X. May be claimed up to three times per day. Valid for all slots, Keno and video poker. WinADay Casino, which celebrated its ninth anniversary last summer, has 77 unique online casino games: slots, video poker games, roulette and Keno. Most of the premium slots are tied to the casino’s site-wide progressive jackpot. In addition to credit cards, Neteller and Skrill, WinADay began accepting Bitcoins last summer.